Is it rare and or desirable (monetarily/historically)? Was there a standard “font size” for music type or was it a range like all other type? Very rare, according to the long-time printer from whom we acquired our plainchant music type- he had seen one case of music type in the 1960s, which he didn’t buy at the time, and had been looking for some ever since. I don’t know about sizes of regular music type, but from the research we have done into Plainchant type, it was made in several sizes, but different stave sizes to regular text type (ie. 28pt). If regular music type is anything like plainchant, the individual pieces, cast in a variety of heights and widths, which are then stacked, to make the complete stave. Because the pieces are different widths, setting music type is rather like a jigsaw or mosaic, but is great fun once you get the hang of it! I hope this helps a bit- if you can I would very much encourage you to buy the type, since it is a rare survival! If you do, buy all the cases, since if it is anything like our plainchant type, all the necessary variant pieces take up a full five job cases. 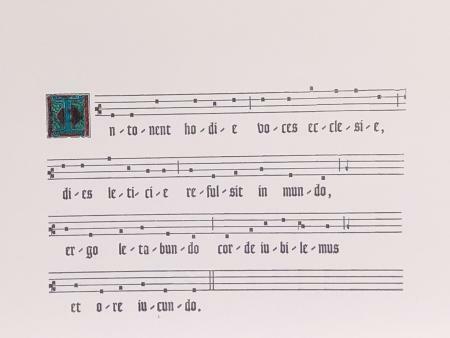 A printed sample of the plainchant- if you look carefully you can see how it is made-up of the individual pieces. 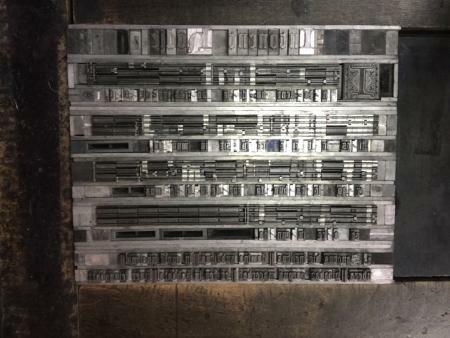 John Southward’s Practical Printing, London 1900, has 16 pages (319-334) on setting music type and shows layouts for upper and lower music cases. No body size given, but his examples are in Miller & Richard’s Gem type. Complex stuff, not for the faint of heart! Wow! Thank you so much for the information! Not sure my eyes would agree with setting this type. I did however acquire the cases so I will photograph them when I get a chance and add images to this thread.